Keeping your rustic fireplace mantel looking great involves proper care and cleaning. With a regular cleaning schedule, you can reduce the need for more in-depth cleaning to once or twice a year. You should dust your mantel as frequently as you dust your other furnishings. You will need to use an electrostatic duster that attracts dust so that you do not push the dust particles into the grain of your mantel. After dusting the top of the mantel, do not forget to dust the surround area on the sides too. If a deeper cleaning is necessary, you can use a special cleaning agent recommended by the provider or mix a gentle solution, such as dishwashing liquid and water. Use a clean rag to dampen a small area at a time using a circular motion to remove built-up grime. Use a clean cloth and clear water to carefully rinse the area and allow to dry overnight. Many stains can be removed through the use of a cleaning eraser according to instructions. You may want to apply a paste of baking soda and water. Apply from the outer edge of the stain and work in toward the center to avoid spreading and let sit overnight. Rinse with a rag dipped in clear water and let dry. 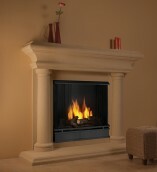 If you are looking for a new custom fireplace surround in Orange County or would like more recommendations on cleaning your current mantel, stop in at SoCal Fireplace Mantels.